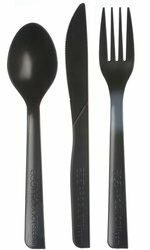 100% Post-Consumer Recycled Content Cutlery, the first of its kind made from 100% post-consumer recycled polystyrene. Traditional single-use cutlery is made from unsustainable virgin plastic. This recycled content cutlery is an industry-first, environmental solution that can help keep waste out of landfills.